There's nothing as rewarding as discovering someone's hidden depths, like when Death Wish III audiences learned Charles Bronson was a surprisingly tender lover -- tenderness that's much appreciated, given said person by law has under 12 minutes to live. 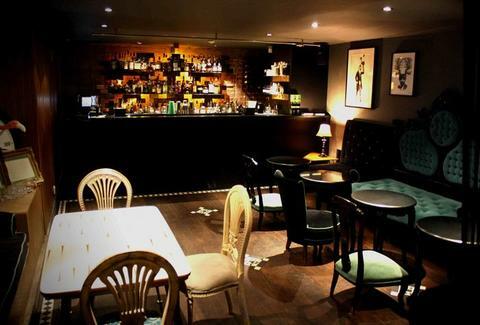 Now discover a bar's hidden depths: the Jub-Jub lounge. Jub-Jub's buried deep in the heart of Shoreditch's Callooh Callay, a dark, eccentrically throwback joint bedecked with gramophones and seventies vintage art; though it's unadvertised by the bartenders, simply ask and they'll guide you through a Narnian-mirrored wardrobe into a passageway leading to an also-secret reservation-only seating area full of retro-sexual reclaimed furniture, then up a subtly velvet-curtained staircase to your final destination. Freshly re-furbed and awash in purple & black, the Victorian-style hideaway features vintage seating (including a French bed-head converted into a chair), a classic bar (stocked with homemade bitters, 20s-style cocktail glasses, and vintage shakers), and wonderfully odd wall adornments: a flamingo head atop an antique clock, and black-line engravings (by artist Dan Hillier) fusing animals with people, e.g. the octopus-lady "Mother" (predicts footie successes, your failures). Every week, a new guest bartender creates a bespoke menu for his tenure, most recently Cocktail World Cup finalist Victor Nordelof, whose concoctions included the Fizz Fizz Bang Bang (Maker's, sloe gin, Lillet Blanc, lemon & pom syrups, Prosecco top) and the El Dorado rum, fig liqueur, raspberry, chai, lemon, pineapple, orange frappe'd Vickerbocker (because all Glory really goes to God). Jub's bar is also fully loaded with rare boozes available in eye-opening taste flights, such as the rum-exploring Goslings Family Reserve/Havana 15 Year/Santa Theresa 1796, or the bourbon-delving Elmer T Lee/Pappy Van Winkle 15/Eagle Rare 10 -- beverages that'll prompt you to reveal your own heart's secrets, causing others to make a Death Wish for themselves.